Regenerating Hand Cream treats you to silky-soft feeling skin and effective protection against drying environmental influences – instantly and sustainably. The composition with rich olive and avocado oils as well as silky cocoa butter helps supports the skin’s strength and elasticity. Nourishing plant extracts of dynamic red clover, bryophyllum and quince seeds further support the skin’s moisture balance. This strengthens supports the skin’s natural resilience right to the fingertips and, with regular use, leaves skin feeling supple and fresh. I'm constantly reapplying moisturizer to my hands throughout the day. Have tried many different (expensive!) brands, and this is by far the best. Lovely mild fragrance, not greasy, absorbs well, long-lasting. Will be ordering more for my purse, bedside, etc. I sampled this and it is great. It hydrates like the Hydrating Hand Cream but seems it has a bonus. This is help for dry lines on the back of the hand. This is an amazing cream for hands. I have been looking for something like this for a long time. I am not getting any younger and need quality products. Thank you Dr. Hauschka. I hated hand creams most of my life and never saw a use it. Around 3 years ago my hands started to get dry ( older skin, more dishes to clean) and I tried all hand cream I could get my hands on. none really impressed me until I tried the Regenerating Hand Cream. Its so moisturizing and way better then the original one. I have 3 bottles in my house so I can take care of my hands. My hands spend much time in and out of water and dirt. Although the regenerating hand cream was soothing, it did not last or protect in the manner I was hoping. Great product, but too expensive! Excellent product and it works well and is not greasy, but too expensive. Absorbs quickly. Works on my dry elbows as well. Hands seem to dry out more quickly now but could just be a coincidence. Not sure if I will purchase again after I finish the bottle. Still debating. During the winter months and especially the last few weeks, my hands crave extra moisturizing. I just started using this hand cream and I love it! It protects your hands from the indoor/outdoor temperature fluctuation and while quickly absorbed, it leaves your hands feeling hydrated and smooth for a long time. 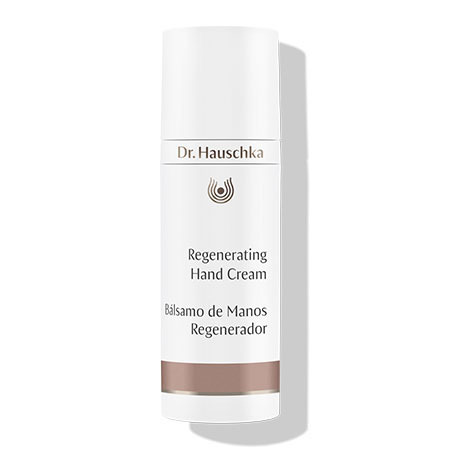 I love the regular hand cream from Dr. Hauschka which is great for regular maintenance for moisturized hands, but this really smooths and heals. Both are great, but it seems this product actively works to address dryness in the hands. My hands looked and felt like baby's skin after using this. I happen to receive some samples of this with one of my orders and am glad I got to try it. My sensitive skin & nose adores this new hand cream. Finally no more chapped hands. And my cuticles are soft too. And I can’t even describe the heavenly aroma. It is so nice, as someone with a fragrance sensitivity to be able to enjoy the scent of something so relaxing. Find out more about Dr. Hauschka regenerating care. Water (Aqua), Alcohol, Persea Gratissima (Avocado) Oil, Glycerin, Olea Europaea (Olive) Fruit Oil, Pyrus Cydonia Seed Extract, Macadamia Ternifolia Seed Oil, Simmondsia Chinensis (Jojoba) Seed Oil, Glyceryl Stearate Citrate, Rosa Damascena Flower Extract, Prunus Amygdalus Dulcis (Sweet Almond) Oil, Sorbitol, Cocos Nucifera (Coconut) Oil, Hectorite, Butyrospermum Parkii (Shea) Butter, Equisetum Arvense Extract, Trifolium Pratense (Clover) Extract, Kalanchoe Daigremontiana Leaf Extract, Honey (Mel), Fragrance (Parfum)*, Citronellol*, Geraniol*, Coumarin*, Linalool*, Citral*, Farnesol*, Benzyl Benzoate*, Eugenol*, Benzyl Alcohol*, Limonene*, Theobroma Cacao (Cocoa) Seed Butter, Oryzanol, Chondrus Crispus Extract, Sucrose Stearate Sucrose Distearate, Xanthan Gum, Lysolecithin, Lecithin. Get to know the products in the regenerating care range with the Regenerating Skin Care Kit.